Manufactured sand or quartz. 4030 grit or similar. Apply a layer Concrete Mender™ to the repair area. Add specified sand and additional Concrete Mender™ in layers. Make sure to fully saturate the sand. Strike off excess sand and Concrete Mender™ and allow to cure for about 10 minutes at 70°F (21°C). Use a razor scrapper to cut the repair flush with the concrete surface. Use a finishing stone or similar device to blend the repair with the surrounding concrete. Pre-wet entire spall with 10 Minute Concrete Mender™. Immediately add 1/2″ of silica sand and completely saturate with 10 Minute Concrete Mender™. Continue in 1/2″ lifts. Make certain all of the sand is saturated. Finished repair is open for all traffic. Any staining due to over banding will quickly wear off or can be removed with a light sanding. Every reasonable effort is made to insure that every cartridge of Roadware 10 Minute Concrete Mender™ is easy to use and trouble free. Below is a list of possible problems, their causes and suggested solutions. For more information, please call Roadware Technical Service at 800-522-7623 or e-mail us at support@concretemender.com. Material has cured inside the static mixer or Flow Controller. Replace static mixer and Flow Controller if needed. Cured material shows intensive marbling and striations. Inadequate mixing. Follow start up procedures carefully. Make sure all air pockets are bled off before application. Use medium even strokes when applying material. Improperly placed or missing Flow Controller. Make sure the holes in the Flow Controller restrictor line up with the openings in the cartridge. Hold the static mixer in place when securing the retaining nut to prevent the Flow Controller from twisting. 10 Minute Concrete Mender™ is very aggressive and will stain exposed skin. Gloves should be worn to keep material from contacting skin. In the event of skin contact, remove immediately with an industrial paint and stain hand cleaner. 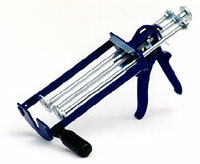 Hold cartridge sideways over a waste container and remove retaining nut, mixer, and Flow Controller. Bleed off a few drops of material to clear out any cured product. Clean Flow Controller and save for future use or replace.